I was glad to see R2D2 joining Rey in locating Luke Skywalker in Star Wars: The Force Awakens, because it gives me hope that he will be featured more prominently in the next chapter of the series. I was an instant fan when I first saw him at the age of 8, and I still am to this day. My sister-in law confessed to me that her first crush was on R2D2, we love to tease her about it. Red Tornado seems like the natural leader of this team but I'd like to see some rotating members. Rotating members, sure. The Vision. The Human Robot. Brainiac 5 from the Legion of Super-Heroes cartoon. Jocasta. Lt. Data. There gotta be a dozen of 'em! But this one is yummy... another goody! 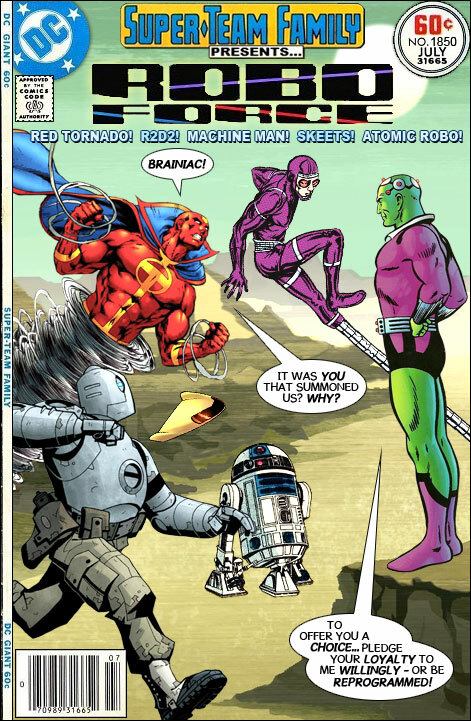 Which members would you expect to rotate better than Red Tornado?!? How about a time travel story where they meet-up with G.I. ROBOT? Kenny Baker passed away recently (last year IIRC); while the producers may replace him as the operator of R2D2, his costars -- especially Anthony Daniels (C3PO) -- said that he gave the characters its heart. It may seem like a minor job with little opportunity for expression, yet I still think that he'll be as hard to replace as Carrie Fisher. I like ELS' listing of Lt. Cmdr. Data to this group; the Doctor (from ST: Voyager) could also fit in. K-9 or Kamelion from the classic Doctor Who could also fit, as could WALL-E. If we're having androids as well as more standard robots, then how about adding the Silver Age 'Captain Marvel'? Given Robo Force's mission of finding what happened to the suddenly-vanished humanity, Sonofjack's suggestion could, rather than tryouts, feature the raising of an army in the penultimate tale for humanity's retrieval. And somewhere along here, you really should have Robo Force vs. Terminator. The pre-COIE revamp was way too ugly to be lovable-to-hate. It looked more like the love child of a Terminator and a xenomorph! "The robot butler from Tom Strong would fit in well as well. (Can't remember his name right now!)" @the Anon between Sonofjack and BG: didn't some insurance company already do a TV commercial with all those robots? Yeah! Either MetLife or Prudential. Daredevil and Batman in: "Gotham's Most Wanted!"